Could the former world champion be making his return to SK Telecom T1? Former League of Legends world champion Jang “MaRin” Gyeong-Hwan has left Afreeca Freecs after a year, the team announced earlier today on Twitter. MaRin first joined Afreeca Freecs at the end of 2016, following his departure from LPL team LGD Gaming. MaRin was part of the massive rebuild of Afreeca Freecs’ roster, which also included former ROX Tigers mid laner Lee “Kuro” Seo-haeng and former Fnatic jungler Lee “Spirit” Da-yun. Despite a rough year in 2016 performance-wise on LGD, MaRin impressed fans with his play on Afreeca Freecs, spearheading the use of champions like AD Kennen. With MaRin’s departure from Afreeca, the community has begun to speculate his future team, with the current theory being SK Telecom T1. 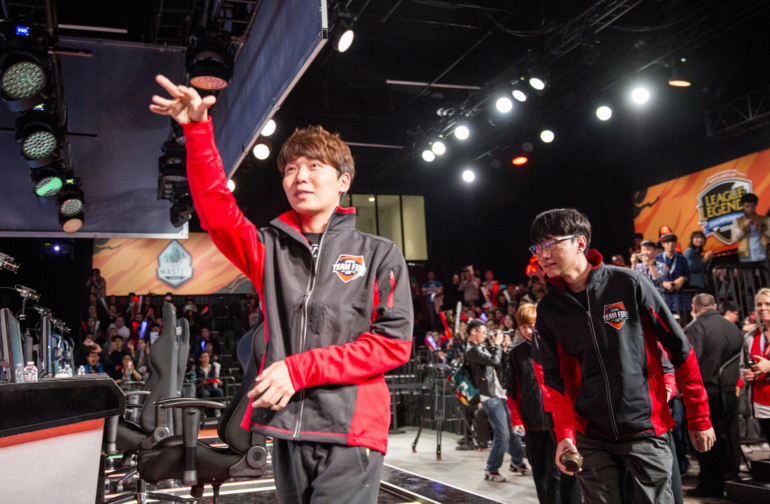 A member of SKT until the end of 2015, MaRin’s return is a roster move many hope occurs. SKT have reportedly been looking for an new top laner, according to an article by Inven Global, making the addition of MaRin not too far fetched a theory. Aside from MaRin, the other five members of Afreeca Freecs have resigned their contracts for the 2018 season, the organization also announced on Twitter. Although MaRin is now a free agent, don’t expect an announcement until after this year’s Kespa Cup, which is scheduled to finish on Dec. 2.